From ending gun violence to combating climate change, young people are leading the way and working to drive real, lasting change in our communities and across the country. Despite this, young people have rarely been included in the conversation around one major, glaring epidemic of our time: ending gender-based violence. While a lot of progress has happened in the effort to combat gender-based violence, the rates have continued to be persistently high for young people: Eighty percent of sexual assault victims experienced their first assault before they were 25. One in nine teen girls experience some fort of dating violence in high school. Young people experience some of the highest rates of domestic and sexual violence but are too often left out of the conversation when it comes to identifying and creating solutions to this problem. This is a blatant problem. We need to be centering young people in these discussions, providing resources and creating spaces for these conversations to take place. That’s why we at YWCA are proud to be a part of the Biden Foundation’s Youth LEADS, an initiative that launched in 2018. Youth LEADS (Leverage, Energize, and Define Solutions) aims to fight gender-based violence among young people by speaking directly to young people about their experiences with violence, and providing them with support and tools to create change and combat violence in their communities. The Youth LEADS team kicked off this initiative by facilitating 15 listening sessions around the country to hear from young people from all backgrounds about their personal stories and experiences with gender-based violence, and what ideas they have for a better future. These conversations serve as the basis for a forthcoming report from the Biden Foundation on gender-based violence and youth leadership. Young people from several YWCA associations participated in these listening sessions, and a number of them will be featured in the official report. 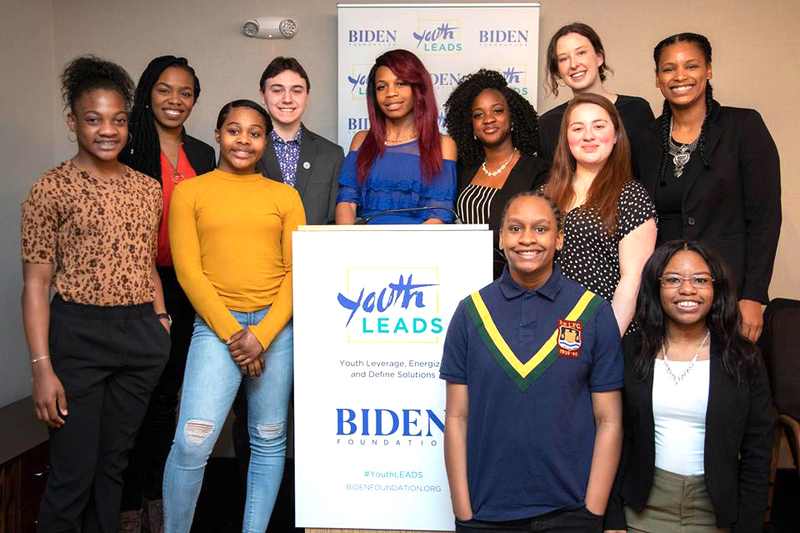 Last week, the Biden Foundation held an event in Washington, DC, to share the findings of the Youth LEADS initiative and hosted a special youth panel that included youth participants from our YWCA family. Taylor B. and Trammela W., both 13, from YWCA Minneapolis and Chyla C. and India R., both 16, from YWCA Greater Baton Rouge, sat on a panel with four other youth leaders from the listening sessions. They talked about their experience participating in the Youth LEADS initiative, and how those conversations have helped to shape and direct the work they continue to do in their communities. Being in the Youth LEADS program has given me even more confidence, and it has taught me not to be afraid to be honest to adults. Also, being on the panel and listening to other people’s stories really made me realize that I have to be careful of what I say to other people. I say that because I don’t know what other people are going through in their lives. The Biden Foundation made me more open to other people’s feelings and to what other people have to say. I think that [Youth LEADS] was a great experience to finally have my voice be heard and for me to be recognized for doing good work for our youth. The Youth LEADS initiative was a good way to talk openly about how I feel about domestic violence. People hearing my voice helps them to speak up about domestic violence. Sometimes, young teens my age or older are scared to tell their stories because they are afraid of what people will think of them. When I went to Washington, DC to speak what was on my mind, it felt like a step forward to help others come out and talk about what they are going through. Knowing that there are a lot of people the LGBTQ community that might not want to tell their story because of the fear of getting physically hurt and other bad things happening to them, I am hopeful that being on this panel will help others understand that they are not alone. One of the many things I have learned in the Youth LEADS program is awareness of domestic violence. Domestic violence does not always have to be men abusing women. It also applies to women abusing men. Learning about domestic violence has helped to build my awareness of the problem and notice red flags immediately, and I can share the knowledge I have gained by informing my fellow classmates and peers about this issue. By sharing information about the signs of domestic violence, I can help more youth to become mindful of this matter. I believe my work with Youth LEADS will empower me to do more in my community. The recognition from the Biden Foundation is outstanding and I am honored to be a part of the National Panel. The Youth LEADS program has given me confidence to voice my opinion. As a teen, you should not be pressured to do anything you are not comfortable with. The program had a positive impact on me because many teens in my community are placed in violent situations. I look forward to sharing the information I have learned with other young ladies and teens in my community, school, and church. I will let them know that it’s okay to speak up and say what you feel instead of trying to fit in and follow others. Attending this event in Washington, D.C. has humbled me, and the acknowledgment from the Biden Foundation has helped to boost my spirit and confidence. It is great to know that my voice was heard! We are humbled and honored to listen to the stories and reflections of these young women of color. It’s clear that to meet and address the needs of youth, we must listen to and amplify their voices. Young people like Taylor, Trammela, Chyla and India are committed to transformational work in their communities and doing the hard work necessary to enact cultural change. Ending gender-based violence takes all of us – and at a time when young people face some of the highest rates of domestic and sexual violence, that means centering and uplifting young people’s voices and experiences. Read Youth LEAD’s recommendations here. To learn more about Youth LEADS, contact YouthLEADS@bidenfoundation.org.